Hey friends! It's winter time, finals are over, and it's raining like the Niagara falls here in Southern California. I'd like to take this time to apologize for the lack of updates lately, because life has been really crazy for me. But now that school has wound down, I can finally sit down and write this update. So sit tight, grab a cup of hot chocolate, and hang out with us for a little bit! In other wonderful KROQ-related news, looks like "The Sound" got played enough on the station to make it back ontp KROQ's Top 30 songs list for last week! The band also played a show in Milwaukee later that week. And here is the last item of today. Switchfoot's 2010 has paid HUGE dividends, especially in terms of the Billboard charts. We saw "The Sound" reach No. 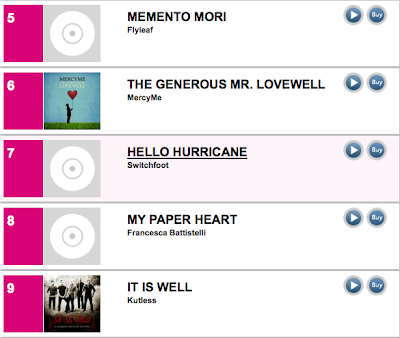 7 on the Alternative Songs chart, two spots higher than "Dare You to Move." Turns out the band has also made its way onto several Year-end charts as well! 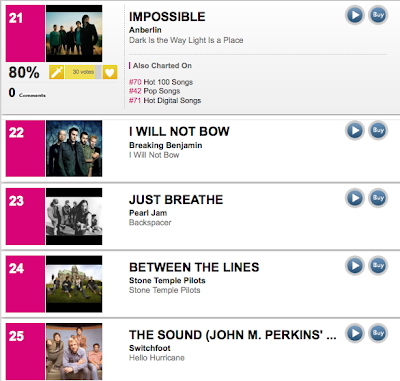 This means that Switchfoot has had the longevity to make it onto one of these charts. Secondly, Switchfoot is Billboard's No. 7 Christian-related artist of the year! Third, "Hello Hurricane" is the No. 7 Christian-related record of the year! It's been an incredible, incredible year. 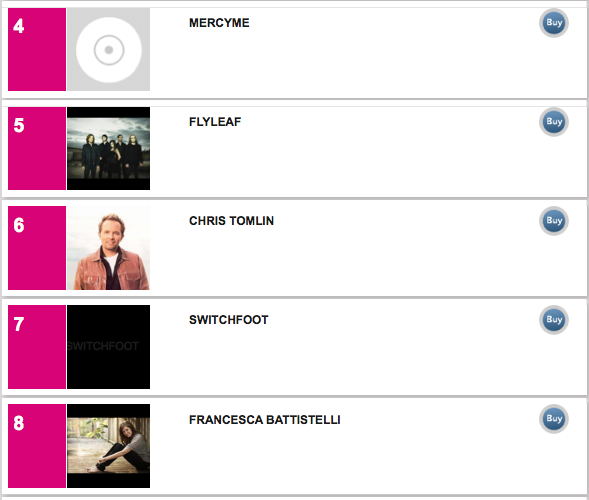 Switchfoot, thanks for another one and let's hope 2011 is even greater, what with "Vice Verses" on the way and all! Also, be on the lookout for some special video the band recently shot with ESPN and Hurley. Also, do you know anything about how "Bullet Soul" is doing at radio? I have not heard a whisper since it was announced. Done! haha. Also, radio is kinda quiet right now. "Bullet Soul" is sitting right outside the top 40 of Alternative and the holidays are sure to slow all the current singles down.